You’re a slow reader or find reading difficult. You’re busy and want to get the most from your reading. You already think you’re a pretty good reader. And the fact is you’re probably right. If you’re reading this, you obviously can read. You may even read quite a lot. But you’re probably not very good at it. Unfortunately, just like the 90% of people who think their driving’s “above-average”, there’s a good chance you’re blind to your failings. What’s more, even if you know you have room for improvement, you may have no idea how to get started. Fortunately, it’s precisely this blindspot that Mortimer J. Adler and Charles van Doren’s How to Read a Book sets out to cure. Why is learning to ‘read well’ important? Because your mind is the most wonderful gift nature gave you. It will outlast your body for decades. It will almost continuously grow, shape and transform your entire experience of life. And books aren’t an optional extra – they’re the key to unlocking your mind’s full potential. They’re a source of unending insight. They’re a limitless well of flash-frozen wisdom from mankind’s best thinkers and doers. The good news? Reading is a skill – one you can greatly improve. Like all skills, it can be broken down, practised and mastered – no matter who you are, how much you read or where you’re starting from. Understanding – to develop insight (to see the world differently). Of the three, reading for understanding is hardest – and the focus of this guide. Why? Because cognitive leaps are hard work. They begin with books that are beyond us, they lead us to new and occasionally uncomfortable truths and they end with adopting a whole new perspective. What is their book about as a whole? How do we answer those questions? We tend to think of reading as passive. But the secret is to realise it’s a two-way exchange. The author’s job is to throw, yours is to catch – a book’s success depends on both of you playing your part. The more active your reading, the better your reading. The better your reading, the better your answers to the questions above. And the better your answers, the more likely you are to see the world in new and wonderful ways. Synoptic reading – Exploring a subject through wide reading. Let’s discuss three general active-reading tips and then examine each level in turn. The first general active-reading tip is so important, we’ve mentioned it already and will come back to it at the end. Always approach reading as a conversation with the author. Approach every book with an open mind and remember that books are the imperfect creations of imperfect creatures. Don’t treat everything you read as inflexible statements of fact. Do question and challenge. But do also make sure you understand what you’ve read before criticising. Active-reading is like active-listening. If you can’t restate the author’s position better than they can, you don’t know it well enough to help fix it. Synthesising – write in the margins, top and bottoms of pages and front and endpapers. Making a book your own as you read improves concentration, encourages thinking (through words) and forces active engagement. The final tip for active-reading is to set your reading environment up for success. Make sure your environment is well lit, tidy and allows you to focus. Treat every session with the same respect as a life-changing meeting of minds. Elementary reading is the skill of turning symbols into information. If you can get from the first to the last page of a book (or if you’re reading this) you’re already there. But one major improvement we can all make is to read with appropriate speed. Reducing regressions – The time you spend rereading. The solution to both is as simple as running a pencil down the page as you read at a slightly faster rate than feels comfortable. With practice, this will help you reduce bad habits like sub-vocalising and increase your reading speed by hundreds of percent. But the most important word in the sentence above isn’t speed, it’s appropriate. “Every book should be read no more slowly than it deserves, and no more quickly than you can read it with satisfaction and comprehension,” Adler and Doren tell us. The key insight is that not all books are created equal. When reading for understanding, one 300-page book may deserve just an hour of skimming, another may deserve days or even weeks of your time. Grasping this marks the difference between those who are widely read (lots of reading, little understanding) and those who are well read (less reading, more understanding). It’s a vital distinction to make. It tells you whether and how to read it. The first will greatly speed up your reading if you decide to dig deeper. The second will save you many hours reading books better skipped. Both outcomes mean mining more insights from books that most deserve your time and attention. Takes: Ten minutes to an hour. Answers: What kind of book is it? What’s it about? How is it structured? Is it worth reading? Title – Take a moment to read it aloud. What does it tell you to expect? Contents – How has the author structured their work? How does it flow? What are the pivotal chapters? Index – What terms are most frequently referenced? Do any surprise you? Author’s preface – What does the author want you to take away? How do they want you to read? At this stage, try to avoid syntheses, commentaries and reviews as these will bias your ability to come to your own conclusions. Read the last two or three pages in the main part of the book. Prose, verse, theatre, other or a mix? Decide whether to read the book or not. If you only live for 700,000 hours (~80 years), do you really want to invest ~6 of them in this book? Is reading this book going to rock your world? Is it one of the ~1,000 good or ~100 truly great books that Adler and Doren suggest might exist? If not, you may want to read something else. Hopefully, you can see how a quick upfront skim and one simple question can save hundreds of hours of frustration and effort. Takes: Depends on the book, but at a faster rate than comfortable. Answers: What does it say (big picture)? 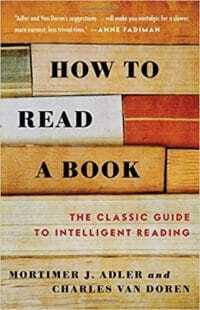 Superficial reading is a simple as reading the whole book, all the way through without stopping. Do take notes and make the book your own but don’t look anything up or puzzle out bits you don’t immediately understand. Analytical reading is the art of thorough and complete reading for understanding. The goal of analytical reading is to close the gap in understanding between you and an author. By the end of the process, you should be able to explain what the author said, what they meant and why they said it. You should also be able to clearly state your position on their work with specific reasons for any criticisms. The three parts that follow give a detailed and idealised checklist. You may feel like you do many of these steps mostly well. The goal here is to make them explicit; to pull the skill of reading apart so you can see, practice and master the components. Challenge yourself to practice each step below (especially where you’re most resistant) the next few times you really dive into a book. Doing so will make you a better, faster and smarter reader. PART I: WHAT IS THE BOOK ABOUT AS A WHOLE? Define the problems the author is trying to solve. Now that you’ve read the whole book once through, the first step in analytical reading is to revise and extend your notes from Inspectional Reading. First, check you still agree with your classification. This may feel excessive but it will help calibrate the rest of your approach. Second, review your synthesis. What is the main theme or point? What is the author trying to achieve? How do they get there? Make this as brief, accurate and comprehensive as possible (no more than a few sentences or a short paragraph). Next, revisit and expand your high-level structure. Identify the main parts of the book. Break each bullet into sub-bullets. Split those sub-bullets further until you have a solid outline of the book’s contents and flow. Finally, make a list of the questions you think the author is trying to answer. What are the main questions? What are their sub-questions? Which questions are primary and which secondary? Don’t just do this in your head. Write them down. PART II: WHAT IS BEING SAID IN DETAIL AND HOW? Decide which problems the author has, hasn’t and knew they couldn’t solve. Where part I of analytical reading is top-down, part II tackles the task bottom-up. Just as writing uses words to build sentences and paragraphs, so logic uses terms to build propositions and arguments. Your work now is to find and relate these back to part I. First, make a list of, then define all the unfamiliar or important keywords in the book – technical, antiquated and otherwise. Use the title, headings, figures, glossary and formatting to help spot them. Once listed, make sure you understand exactly how the author is using these words; be sure you understand what they mean. Glossaries, dictionaries and reference books can help (especially for technical jargon). But the most important clue here is context. What do the words around the keywords say about how the author is using them? What about the rest of the book? The combination of keywords and the specific way an author uses them are the author’s terms. Second, find, highlight and dissect the sentences whose meaning is either not immediately obvious or that are clear declarations of knowledge or opinion. These are the author’s propositions, the foundations that support their main arguments. A good way to spot these is to look for high concentrations of the terms that you gathered above. Once you’ve found them, puzzle away at these propositions until you can re-state them clearly in your own words. Alternatively, challenge yourself to exemplify the general truth they imply with a specific personal example. Both exercises will challenge you to show true understanding. Finally, find or piece together the collections of sentences or paragraphs in the book that connect one or more propositions in support of a particular conclusion. These chains of logic are the author’s main arguments. To spot them, look for things the author states they must assume, can prove or need not prove because they are self-evident; look for conclusions where you find reasons (and vice versa). Finally, relate your analysis back to your observations from part I. What problems has the author solved? Which have they missed? Where did they know that they failed? PART III: IS THE BOOK TRUE, IN WHOLE OR IN PART? Be specific in any criticisms you make. A general rule for criticism is to always approach a book like a light-hearted and constructive problem-solving session with a friend. Begin with an open and collaborative mind, assume benign intent and be able to state the other person’s position better than they can before weighing in with your own. Remember that both you and the author are (usually) just as curious about and interested in finding the truth. Focussing on that, and not who is right or who is wrong, will help you get more from your reading. Where you do disagree, monitor your emotions. Remember, just because you don’t like someone’s arguments, it doesn’t necessarily mean that they’re wrong. Always criticise with an eye towards resolution and keep your own propositions and arguments to the same standards as you hold the author’s. And remember, there’s a very good chance that it’s you that may misunderstand or be ignorant on some important point. Incomplete – One or more important additional conclusions omitted. One or all of these may be true, but only for specific parts of a book. “The person who says he knows what he thinks but cannot express it usually does not know what he thinks,” Adler and Doren remind us. So when you criticise, make sure you can clearly explain where your criticism applies, what kind of shortcoming you’ve spotted and (for extra points) how you might improve or rewrite the argument. If you can’t, be as suspicious of yourself as you would of someone else criticising your work whose best explanation is “a general sense of unease”. And remember, until you can level at least one of the first three points at a work, you cannot (logically) disagree with its conclusions, even though you may dislike them. If you’ve successfully applied the three parts of analytical reading you should find the gap between you and an author has closed considerably. Congratulations! Using nothing but the power of your mind, you’ve conquered a book that was once well beyond you. You’ve elevated yourself from student to peer. You’ve met the mind of the author as equal and seen the world through the eyes of a giant. That’s pretty amazing. Synoptic reading is the art of exploring a question or subject by reading widely. It’s not about reaching conclusions. Instead, it’s about putting together a really good map. It’s about discovering and noting the landmarks, the sights and the hazards so that when you do set out on the journey, you’re the best-informed traveller out there. The most significant shift here is from a book-focussed perspective to a subject-focussed one. Where analytical reading treats a book as an end in itself, synoptic reading treats a book as a means; as an input to a wider discussion. Realise more than one book is necessary to tackle it – Sounds obvious, but how many people do you know (including yourself) that read one book and then regurgitate it like it’s the single, objective authority on a topic? Shorten your bibliography – Include only those books that say something important about the questions you’ve asked. Roughly what side of each question those sources fall on. Analyse the discussion – Order the debate to throw as much light on the subject as possible. Remember, synoptic reading is like drawing a map – keeping it as objective as possible will give you the best chance of safely navigating your subject. With this in mind, take particular care in step 5. Watch out for soft biases when ordering your questions, the debate and especially in the tone of your writing. Cast the facts as you wish, but remember, your thinking will thank you if you can resist adding bias too early. So there you have it! Still feel like your reading has no room for improvement? Hopefully, this crunch of Adler and Doren’s How to Read a Book has shown you how much more there is to reading than meets the eye. But also that reading is a skill – one you can greatly improve, no matter who you are or what your current experience. The big secret? Activity is the essence of good reading – the more active the better. And to get there, we’ve explored not just four levels of reading (elementary, inspectional, analytical and synoptic), but also a huge number of practical ways to get started right away. I hear you. There’s no escaping the fact that learning to read well is a challenge. But so is learning or perfecting any new skill. And sure, you could happily get through life with average or even below average reading skills. But the benefits of learning to read well are so enormous that any effort you make is well worth it. So don’t just settle for being an average reader. Become a good reader. Heck, become a great reader. Because doing so won’t just make the next book you read a more interesting, valuable and meaningful experience. It will elevate your mind to the level of humanity’s greatest thinkers and doers. It will transform your experience of life. You’re welcome, Michelle! Good luck and good reading! Thanks, Michael. Great to have you here!